Certain things were easy enough to spot: those are Pontiac Firebird taillights and that’s an aftermarket Astrali steering wheel. Indeed, though there’s a lot of Corvette in this car, it looks like it has a Chevy V8 mounted behind the driver, seen right under that Corvette rear hatch! Those are Mickey Thompson valve covers, but that doesn’t exactly help us with anything. Nor does this strange badge on the side give us any real clue. It looks more handmade than anything else. The dashboard, I will also note, doesn’t match a C4 Corvette, nor does it match the Pontiac Fiero, the typical base for kit cars like this ought to be. The closest match I could find is a first-generation AW11 Toyota MR-2, but even that’s not perfect. While furiously googling different combinations of “small block chevy ferrari corvette kit car” I found this CorvetteForum post in which a kit car owner asks for some help with engine tuning and ends up explaining that the kit car itself is based on a fully custom Howe racing chassis with everything else being custom. That’s when I gave up hope that I might discover the car being a “Jowington Sports EXP” or a “Rarecar Nameijustmadeup XR-4.” It could well be a one-off, made by one enthusiast and cherished with little else of an identity. Nobody else on Jalopnik’s staff was able to figure much else out about the car, only ID’ing its piecemeal parts. Maybe you, out there, know this individual car’s history. Maybe you know the person who built it, or remember when it drove through your town. Let us know. Please. It’s tearing me apart. Little would make me happier than reconnecting with this car and getting it put back to perfect order. If you know the owner, please get in touch. 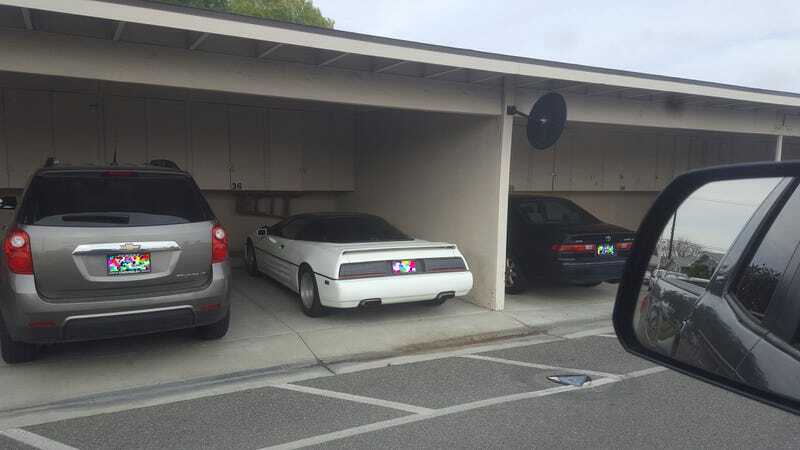 31-Year Old Spy Hunter Car Mystery Solved! Is This A Crazy Experimental Aircraft Hiding Behind Vector’s Factory?